This dump is solid. There were some additional questions that aren't available on this dump. Someone placed a link to a share, but since the link has been removed. Another dump has been created with the new drag & drops. The additional questions have been added as well. About 30 new items in all. I passed today, with a 900 (05-18-12. 9:15 a.m. EST.) I used this dump, some information from the additional dump, CBT nuggets and I work in a Win7 environment. If there are any questions, please get at me via e-mail. Makaveli7414@Tampabay.RR.Com. Passed on first try with an 820 today. Only used this dump. There were about 8 questions that I ran across that were not on this dump. This engine helps alot, gave the resources used so I could futher understand the information. Scored a 820 today, I used this engine and some skillport if you ever heard of that. All but like 6 out of 55 were on it. Hi, this is the pdf posted by Ms_Exam yesterday. Someone who has done the exam can 'tell me if it is actually valid? The link to the pdf and to the vce made from it was here last night. I downloaded both of them. I don't know where they went. I can post them if somene needs them. Trying to put it in vce format.. gonna take a while. Hope to have it done by tomorrow, gonna take the exam on friday. MS_Exam from Pakistan. Any chance that you can share this with me. I should be able to convert it to vce. I have my test this Friday and would love the latest info. I got the orignal material, Which includes the new question, testlets hotspot and drag and drop. But the issue is the material is in PDF format. I will provide it freely but who take the responsibility to convert it into vce? Thanks for this dump, i used several dumps but this one is the best (also the comments why the answer is good/wrong is very helpfull!). I managed to score 800 today, i took my time for this exam. Readed book, watch Nuggets (very handy!) and used some dumps. Please share with us book and cbt nuggets on email sajjad083@hotmail.com. i wana attempt this exam in next 2-3 days. Passed exam yesterday with 720 (The first attempt was faled 667). There are a 55 questions and 2 testlets. The dump is valid. But my advice is read something exept dump. Many new qes. about 10-12, the first testlet was overall new. taking the exam today…will post results. Failed today with score 525, not happy with the previous practices, i need to ensure that i understand the proper questions, and i need to read the clear questions, and the answers. I'm so sad, have to re-book another exam in two months time (nathandrake@hotmail.co.za) if u wanna blog me. i had more than 20 new questions. Passed today with a 760. The dump is definitely still valid, but be ready to answer at least 10 questions or so completely on your own. As long as you know the material you'll be fine. Guys, the last comment that was made today (05 3 @2:54 PM ) is not the real Palm Beach PC Services. I am the real Palm Beach PC Services and yes I passed the exam yersterday with a score of 720. along with this dump I used the Microsoft practice test; however none of the questions came from the Microsoft practice test. I cannot believe someone would even use my name to give false information. Shame of whoever did this. Palm Beach, you're not helping anyone out here by leaving bogus pass results. I'm playing with you guys…You will not pass this exam if you only use the dump. They are always adding new questions to the mix now. Once you think you are golden….BAM they mix it up. I passed today with a score of 720. The exam is still valid and you should be able to pass studying this dump. I should have scored more. I second the comment below. I gotta take this thing on Saturday, and the mixed reviews below are making me real nervous. Sure I use other study guides, but its always nice to have some confidence going in. How valid is this dump? There are mixed reviews. Some are passing, some are failing? The last update of this dump, were any new questions added? Will there be another update soon? I used the dump but questions have changed. Too many new questions. Barely passed the exam today with a 760 score… lots of drag and drops, tricky questions, lots of virtualization (MED-V, App-V, RemoteApp) questions. Lots of materials came from this particular dump (by horshiyang), so memorize this then study CBT nuggets … good luck! Still valid. Passed yesterday. No new questions. There are a lot of new questions will make you get crazy. i Passed Exam with Score ( 780). 2- it was photo and you choose Scripts logon or control panel, … ( i don't remember more). Note: it wad drag and drop question. Passed because I read the self study. Do not check the other boxes that I've marked in blue unless you want to lock down your users to only using your wireless APs (which will also block APs at airports, starbucks, etc). That "Only use group policy…" setting is bad news for your traveling employees. Once these settings go into effect, the windows 7 clients may require a reboot or two before the changes kick in. 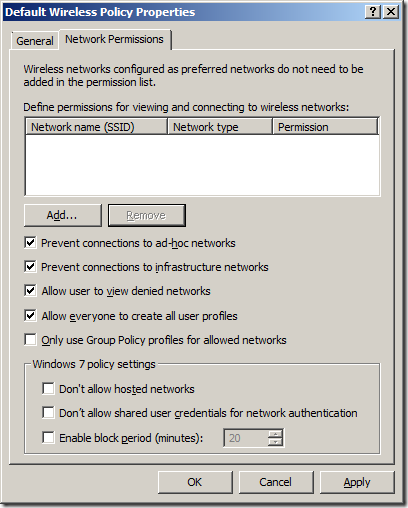 These changes also will only work if they are using the default built in wlan client that comes with windows 7. (See checkbox setting on first tab of that policy window). The first 5 were the only options to check ( checkboxes ), I choose as the answer:" prevent connections to ad-hoc networks". Cant say it is the right answers, but the question was clear and that would be the right answer in my opinion ( note: you could have checked more ), but i dont think the other options were right in my opion. 3 offices, 1 main and 1 branch office with Windows Server 2008 R2 installed. 1 office doesnt have a server. The two branch office are not connected to the internet. You have a picture on http://technet.microsoft.com/en-us/library/cc720448(v=ws.10).aspx that makes it more clear. You need to deploy WSUS. The drag and drop answers were as following. You have to drag and drop it to each office which was the right option. something with installing an upstream server or downstream ( cant really remember sorry ). Downstream server to able to download it from the main office, since the branch office is not directly connected to the internet.